I was browsing back through a few of my old reviews today and realised a couple of my opinions of certain products have changed since I reviewed them, as sometimes initial opinions and opinions after using products for a couple of moths are different, so here is my first review revisited. Back in September I compared Collection 2000 liquid eye liner and Maybelline eye studio 24h lasting gel liner, if you want to read the original in full then it's here- splurge-or-save-on-eye-liner.html-but basically I concluded that I preferred to save by buying the Collection 2000 liner as it was only £2.99 and the pot lasted ages, however I think one of the main reasons I came to this conclusion is because I'd been using it for a few years and was very used to it, where as the Maybelline liner was a new purchase. 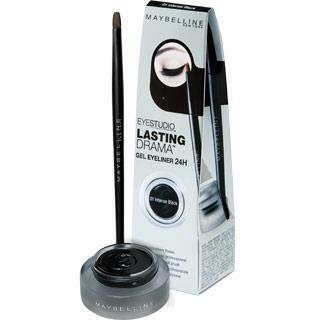 Now after using the Maybelline liner for a few months I have come to a definite conclusion that I actually couldn't live without it and will probably never buy a different eye liner again! Easier and quicker to apply than I thought it would be- I managed to apply it perfectly in a moving car! -It is still this price, but well worth it for the quality of the product and £7.99 won't break the bank anyway. - After a bit of practise I've now learnt how to easily create the flicks I like with the applicator. -as long as you coat the brush with enough gel and don't let the gel dry out it does actually glide very smoothly onto your lid. -when I want the line darker I just go back over it. -This is the main thing I was wrong about, as although the pot looks tiny the one I got back in September is still going now even though I've used it everyday since! -This is the one thing that I still think is a con, as my brush is very clogged with gel now and I've almost lost it a few times, however next time I buy it I'm just going to make sure I clean the brush after every use and look after it! Well I hope that's helpful to some of you! I thought it was important for me to let you know what I think now I've had the time to make a more informed opinion as I would hate for people not to buy this product just because of my initial impressions of it! I'm going to make sure I use every product I review for quite a long period of time in future, so I don't have to make too many review revisits! I hope your all having a great Saturday night and enjoying Strictly like I am! I love your blog! I followed you! Please check out my blog and follow me? http://camigmakeup4u2c.blogspot.com Thanks so much! Great post, i always change my mind about products over time too. I have this gel eyeliner but i havent used it for a while, might have to start using it again! OOTD- I wish it could be Christmas Everyday! OOTD- Have yourself a merry early Christmas!